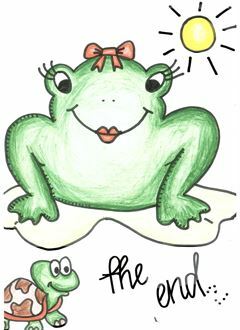 Once upon a time, in the Rainbow Pond, there lived a family of frogs. They loved living in the pond with their friends and catching flies in the reeds. One bright sunny morning, a group of frog’s eggs known as spawn, was floating in the shadow of a leaf, on top of the water. By the afternoon, one of the eggs hatched and out came a baby tadpole. Her parents decided to call her Roxy. As a tadpole, Roxy enjoyed swimming around the pond with her brother and sister who also had hatched from the floating eggs. They swam through the reeds, played hide and seek in the lilypads and raced along the stream. Roxy was very happy being a tadpole with a swishy tail, as she often won races with her friends. One day she noticed something different. As well as a tail, she also had grown two legs. “Wow” she thought to herself, “what can I do with these”. She found that she could use her legs to help push her out of the water. The next day when Roxy left her home to go and play with her friend Rosie, the turtle, Roxy found she had grown two more legs. Sally the duckling and Rose the turtle found Roxy crying. “Why don’t you come with us and we’ll have a race?” they suggested, trying to cheer her up. 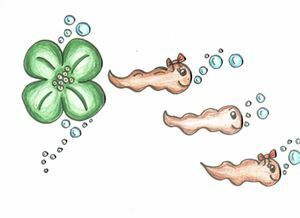 They rushed to their favourite lilypad to start the race, “Ready, set, go” quacked Sally. They began and just like that, Roxy’s tail fell off. Her legs began to move back and forth, propelling her through the water, faster and faster. When they reached the finish line, Roxy found that not only had she lost her tail but, she could now jump. She tried to jump onto a nearby rock, “1, 2, 3, go”, cheered Sally. Roxy concentrated with all her might and she did it. “Yay” cheered Rosie and Sally together. Now Roxy is a big beautiful frog after all. Over the next few days, Roxy found that as well as growing legs, she also changed colour. Rather than the grey colour she was, she had now become a beautiful green colour, her eyes had grown bigger and her face had changed size and shape. 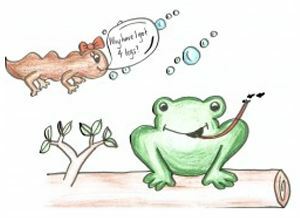 “Wow, that thyroxine must be good for our bodies to make me change from a small tadpole into a beautiful big frog,” Roxy told her friends. Roxy was now happy with all the changes that had happened to her. She did not feel sad anymore and had a wonderful time playing with her friends, catching flies and jumping wherever she wanted to go.